Pray without ceasing.. Pray continually… Pray constantly… Pray..
How important it is to have unbroken fellowship with the Father. How precious it is to have continuous communion with Christ. How glorious it is to have gracious intimacy with the Holy Spirit. Throughout Scripture we are encouraged to develop this tender affinity with God. Praying is releasing the sigh of the heart into God’s presence. Praying is resting one's weary soul on the bosom of the Father. Praying is revealing a confidence in the power of the Spirit. Praying builds up our assurance of our righteous covering in Christ. Praying aright causes the breath of man’s soul to touch the Father- heart of God. Prayer is also a vital and potent weapon in our complete spiritual armoury. How frequently and fervently we are encouraged in the Word to pray. 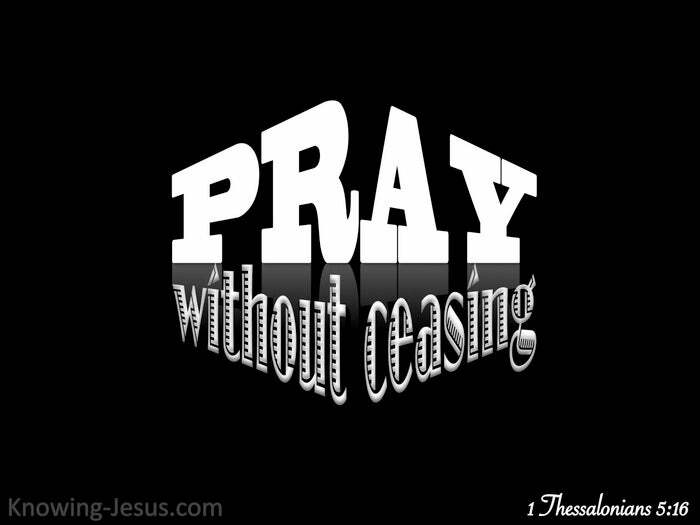 Pray without ceasing.. Pray continually… Pray constantly… simply Pray. But sometimes as we read the many exhortations to pray it seems an impossible task! How can one pray everywhere? How can we be engaged in praying night and day? How can we be instant in prayer; always in prayer; continuously in prayer? – how can we pray without ceasing? I heard once of a group of pastors who met to discuss the issue of prayer. One question that stumped this reverent group was how to “pray without ceasing” Comments were passed; questions raised and heads shook at the impractical ideas. Ideas were raised; proposals made, suggestions shared on this grand theological issue – but this complex scriptural instruction became a stumbling block to this holy huddle. A resolution was finally agreed: a lengthy thesis on this prayer problem must be written, and one of their worthy members was duly appointed for this gruelling ordeal. He was to present his findings to the group when the task was finally completed. A period of time was set aside to wrestle with this complex issues of ceaseless prayer – and a whole month was set aside to wrangle with this deep ecclesiastical problem. Unbeknown to this group of ministers their discourse was overheard by young lady. She has been serving tea to the little company and could not contain herself! Why, she exclaimed, I consider that to be such a simple text in scripture… Intrigued by her enthusiasm the waitress was asked to explain herself.. Can YOU pray without ceasing and engage in prayer day and night? she was asked. Indeed, I can and it is my delight to do so, was her quick and genuine reply. Please tell us how this impossible task of our Lord many be achieved, they asked. How can a busy woman spare time to engage in continuous prayer? they continued. Most people find that the more things we have to do the less time there is to pray… Oh sirs, was her simple reply, the more I pray the easier it becomes to pray!- and she explained how her heavenly Father was with her in every aspect of life. As I open my eyes in the morning, I pray ‘Lord, open the eyes of my understanding. Thank You for this new day – may it be a day that I grow in grace and glorify You. While I am dressing, I pray that I may be clothed with His robes of righteousness – that the body of Christ may be given discernment and made pure and without spot. As I wash, I ask for the washing of regeneration – the washing or the word within. When I work, I pray for the strength equal to my day, for the joy of God is my strength I lift up those that are weak and ill and intercede for those I know that are struggling. When a dear friend or hurting person comes to mind I intercede for them, too. When others harm me or cause pain me or falsely accuse me I pray “Father forgive,” When I have sinned or discredited my Lord – I confess my sin at His heavenly throne. As I sweep out the house, I pray that my heart be cleansed from all its impurities; I pray that the Spirit will search me and know my heart and identify my faults – I pray for unbelievers who are dead in sins that the Spirit convict the of their need. While preparing food or eating a meal, I thank Him for His gracious provision, I pray I may be fed with the hidden manna and drink the sincere milk of the Word. I pray that I eat the meat of the word and that I come to a deeper knowledge of God – I pray that many hear the Word and find their rest in my Saviour. When grief strikes – I pour out my hurt to Him. When joy fills my life – I thank Him for His blessings. When difficulties surface – I cast them on the Lord as instructed. When others are in distress – I lift them up into His heavenly keeping. When I am busy with the children I pray that they come to know and love the Lord, – I pray that I become as a child –trusting His word with a heart of grateful thanks. As I wash the dishes I may reflect on God’s goodness and confess my insufficiency. As I kneel at my bed at night I listen to His voice; seek His face and rest in His love. I thank Him for my life, my home and the grace that He showers on me daily and in troublesome times I shoot out an arrow of prayer into the throne-room of God. Her simple testimony gave those minsters a depth of understanding they never imagined. It’s good to take quiet time alone with the Lord in intimate prayer behind closed doors – but it is also incumbent on us to pray without ceasing – in every part of our life. To pray aright and without ceasing is important – precious and glorious. When we pray aright we remain in unbroken fellowship with the Father. When we pray aright we remain in continuous communion with Christ. When we pray aright we remain is gracious intimacy with His Holy Spirit. To pray aright – and without ceasing is important – precious and glorious. 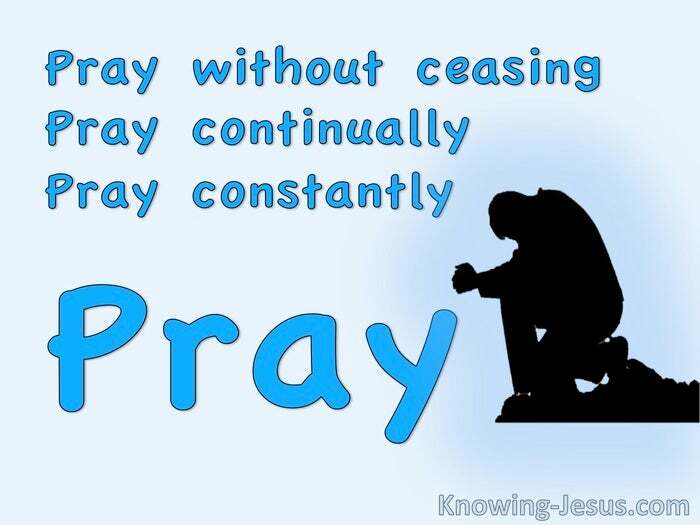 Let us Pray without ceasing; pray continually; pray constantly… and PRAY.